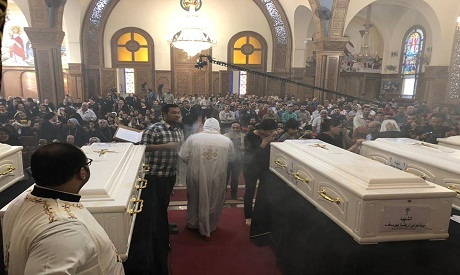 In Minya, hundreds of Coptic Christians gathered for funeral prayers on Saturday at a church in the city of Minya for the seven victims killed in a terrorist attack on a bus carrying Copts near the Monastery of Saint Samuel the Confessor in Upper Egypt's Minya governorate on Friday. 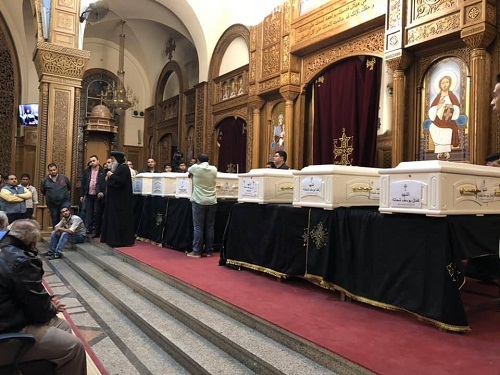 During the funeral prayers, Bishop Maccarius of Minya that the church had already prayed for one of the victims late on Friday, and that they now pray for the six other victims, who hail from one family. At Al-Amir Tadros Church in Minya city, where most of the victims were from, women dressed in black demanded justice for the martyrs. Mourners held pictures of the victims and flowers and the cross, calling on the authorities to act. Their grief quickly turned to anger as funeral prayers at the Church gave way to protest chants as the mourners carried a large wooden cross. “With blood and soul, we will defend you, oh cross,” they chanted. In few words during the funeral prayers, Maccarius attempted to calm grieving mourners with words of faith. "No one accepts injustice, intimidation and blood shedding. I am grieving just like you all and they were our sons too, but I am also proud that Minya is offering more martyrs every year," Maccarius said. The bishop also highlighted that the conditions of those injured in the terror attack were improving. The injured are being treated at Sheikh Zayed hospital in Giza. Security sources say that the bus, which was carrying the victims, was using a back road to reach the monastery, as the main road to the monastery had been closed per security instructions, due to the danger present in the western part of the governorate where the monastery is located, and the lack of communication networks within the vicinity. Security forces are searching for the unknown gunmen who carried out the terror attack on the bus. On Friday, Egypt’s prosecutor-general Nabil Sadek opened an investigation into the attack. Meanwhile, Egypt's President Abdel-Fattah El-Sisi issued a statement on his official Facebook page on Friday mourning the victims of the terror attack, vowing to bring the perpetrators to justice. "I mourn with deep sorrow the martyrs who were killed today by treacherous hands which aim to undermine the solid fabric of the nation, and I wish speedy recovery for the injured," El-Sisi said. The President also called Pope Tawadros II, the head of the Coptic Orthodox Church, to offer his condolences.